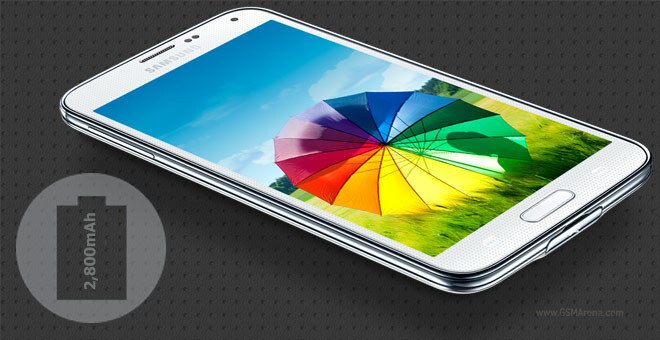 The Samsung Galaxy S5 is bound to become one of the hottest selling handsets and so it must undergo heavy scrutiny. Battery life is an everyday worry, especially with bigger screens and faster chipsets. The Galaxy S5 screen isn’t much bigger than that of its processor (5.1″ vs. 5″), but it is brighter. The Snapdragon 801 chipset should also offer a big performance boost over the Snapdragon 600 of last year. Samsung has enabled a couple of battery saving features ranging from practical to extreme. The Ultra Power Saving mode disables most functionality and shows a simplified black and white homescreen. We didn’t use those features for the test as they are for emergencies when the last few percent of the battery have to hold out for hours before you can charge the phone again. The Galaxy S5 lasted over 21 hours of 3G calls. That puts it ahead of the HTC One (M8) by an hour, three ahead of the Galaxy Note 3, but well behind the impressive 25 hour result of the LG G2. The Samsung Galaxy S5 has a 2,800mAh battery, a 200mAh bump from the S4. The LG G2, for comparison, has a 3,000mAh battery. The Samsung phone lasted nine and half hours of browsing the web over Wi-Fi, beating the One (M8) by half an hour but again lagging behind LG G2. The HTC One (M8) does come out ahead of the Galaxy S5 in the video playback time, but by just a smidge – both new flagship lasted 11 hours. Even the LG G2 failed to pull ahead by much here. Compared to last year’s Galaxy S flagship, the Galaxy S5 manages three hours more of talking and two hours more of web browsing, but an hour less of video playback. The Galaxy Note 3 with its 5.7″ screen 3,200mAh battery was behind the S5 in everything but video. Efficient standby on the new phone results in an Endurance rating of 72 hours, which puts it between the Galaxy S4 and the Note 3. 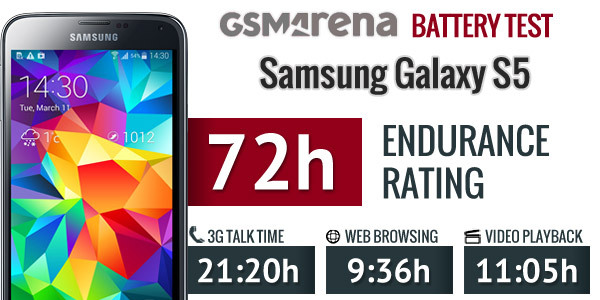 Even without Samsung’s advanced power saving modes, the Galaxy S5 offers excellent battery life. With moderate usage you can get three full days of usage before you need to charge your phone. Don’t forget to check our Battery life test page if your phone usage differs from the standard one hour of each per day we use to calculate the Endurance rating.